A couple of weeks ago, Benfica had just lost first place to FC Porto in the Portuguese championship, the outcome of their Chamipons League tie was uncertain and their manager Jorge Jesus basically had to go. As things stand today, the Eagles may well be Portuguese Champions, win the League Cup and have the opportunity to fight Chelsea for a place in the Champions League semi-finals. Things surely change fast, when it comes to football, don't they? Yesterday's League Cup match between Benfica and FC Porto was an interesting event, far from what both managers tried to make us think - something that neither team really wanted to win. The match was all too similar to the latest league fixture and therefore the analysis will tackle more specific issues. 1. There's logic in chaos. Remember Maxi Pereira's goal against Zenit? 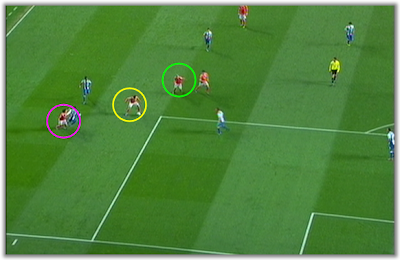 Now take a look at Benfica's positioning for last night's first goal and see if you can spot the differences. Once again, Witsel (pink), Bruno César (yellow) and Maxi Pereira (green) pressure and overload their opponent's left side. 2. Benfica still defensively vulnerable through the middle. If the Eagles want to be successful against powerhouses such as Chelsea, it's mandatory that they can exert better control over their adversary. Yesterday, we often saw the mere presence of Javi and Witsel a bit further up in the centre, which makes it very easy to overrun them. 3. Benfica excel in set pieces. Even though it's a bit hard to understand why exactly other teams don't seem to be aware of it, Benfica keep on being prolific from set pieces. Last night was just another example (there were three other shots that hit the woodwork), just like the previous match between these two teams or the Zenit match. Luisão (yellow) offers the screening to free up Javi García (blue). Déjà vu, anyone? 4. Benfica showed once again they are capable of adapting within the match. 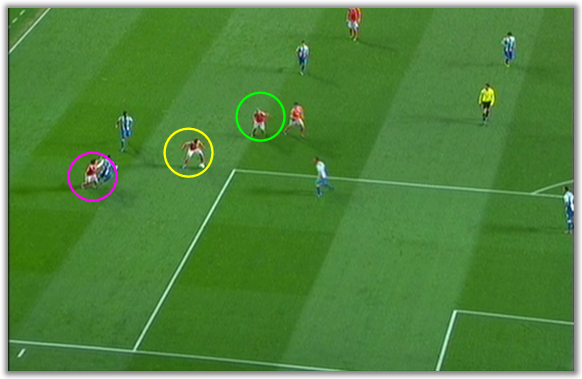 After being beaten for Mangala's goal, Jorge Jesus changed the distribution of Benfica's typical zonal marking approach. 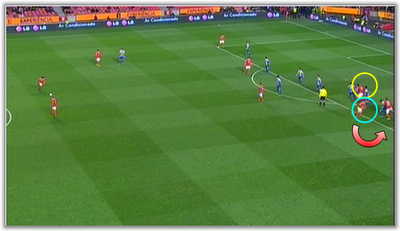 Benfica's typical zonal marking, with no coverage in front of their line. Mangala would score. 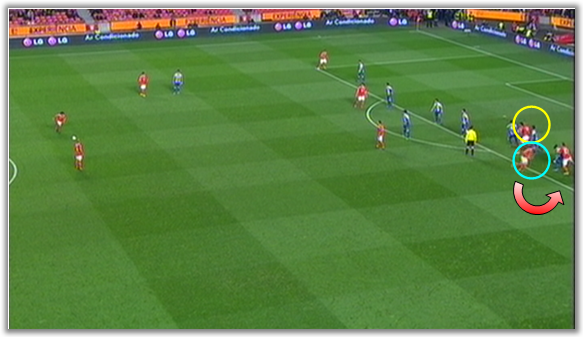 Benfica adapted their zonal marking shape for the second half. FC Porto would not create another scoring chance from set pieces. 1. The left wing is still an express way for opponents. Despite his transfer fee, Alex Sandro proved he is still too green for these heights and that he is no substitute for Álvaro Pereira (for now, at least). In turn, Álvaro Pereira proved once again that his defensive contribution can be sketchy (to say the least), at times. 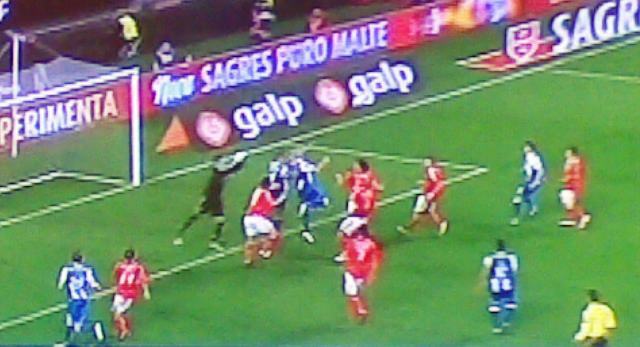 Even with João Moutinho helping down that wing, the Eagles kept ramming FC Porto's left side. 2. FC Porto hurt their rival's open wound. Aware that Benfica were vulnerable defending set pieces, the Dragons didn't hesitate. Mangala's goal from Moutinho's free kick certainly had nothing to do with chance. The ball was sent to the exact same spot as James' free kick for Maicon's head. 3. FC Porto were better at controlling the game. With Defour, Moutinho and Lucho, FC Porto were capable of dictating the tempo of the game and provide better defensive coverage for their back four. Unlike Benfica, where Javi García is often left stranded, FC Porto are better at defending the centre of the park. FC Porto always tried to make sure they were up in numbers in defensive situations. 4. Your opponent will charge down the right? Then motor down that side yourselves. Despite having Hulk against Capdevila (an odd option for this particular match), FC Porto tried to exploit Maxi Pereira's surges upfield and the lack of protection from Bruno César. Lucho, usually defending more to the right, would often drift to the left to overload that side. Maxi Pereira, Javi García and Witsel are all drawn to their right side. Notice how little protection these players have. All in all, it was an interesting, even match. Even though this was a lesser competition, neither team wanted to lose and give away the upper hand for the league (which was what really was at stake, here). FC Porto were better in open play (tiring out in the second half), but Benfica was just irresistible from set pieces.